Stamp sentiment on 4” sq Very Vanilla Card Stock after punching out a 2 ½” circle. Using modern label punch, punch out shadow piece for sentiment. Center the Botanical Gazette piece of card stock on the 3” circle die and put thru the Big Shot. Save the circle, it is the shadow piece for the 2 1/2 “ circle. Attach the shadow piece (step 2) to the back of this circle. Line up the two 4 ¼” pieces. Put SNAIL on the back of the shadow piece and set in the cut-out hole. Attach the two pieces together from edge to ½” crease line. This style card can be used for any occasion. Have fun with it, and let me know what you create. The Petal Cone Die is very versatile. For this card I cut the cone piece in half to form the ice cream cone shape, then ran it thru the Big Shot using an embossing folder. The chocolate, strawberry, and vanilla ice cream were made with the 2 3/8 Scallop Paper Punch. Topped it all off with cherries made with our red glimmer paper and the Build A Cupcake Punch paper punch. All the card needs is a sentiment to finish it off. I'm teaching two sets of classes today, so my next blog post will be on Monday. 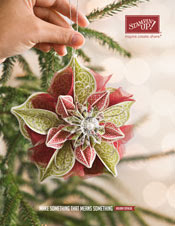 Watch for more ideas using the Petal Cone Die. Your next party is sure to be a hit when you give favors and gifts in this fun vintage looking petal cone! 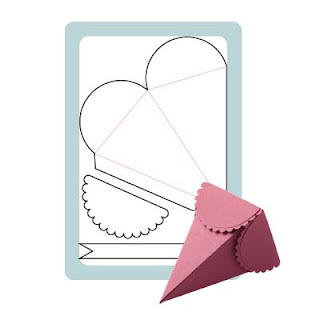 Use the banner element to attach a label or greeting to the petal cone and scalloped half circle to add huge decorative appeal to the flaps on top. You can also use these elements to create custom embellishments for any other projects as well. ■ Die measures 6" x 8-3/4"
The next couple of days I will be showcasing items that I made with this die. It is really versatile. This card was creating using Stampin' Up! Nature Walk Stamp Set and Botanical Gazette Designer Series Paper (DSP). The card can stand alone. Amazing what you can created with just a few creases/score lines and circle die and punches. This is our 2nd project at class on Saturday. Directions will be supplied later on as it will be given to class attendees first. Nature Walk Stamp Set, item #121925 - Wood OR #121997 - Clear Mount. I attached one to a metal circle shaped container I found. I could line the container with felt or velvet and use it for jewelry or small gift item. The newest digital downloads have just been released. You can view them on-line at this LINK. I was so excited to see the Cottage Wall Designs DSP being added to the digital downloads. It was an all time favorite DSP for me and retired last year I believe. Many more downloads to choose from. Each month I participate in a card swap with my Stampin' Up! Downline (team members). This month I created a card that combines both digital and traditional card making items. The tempting turquoise card stock, basic black card stock, ribbon, 1 button, 1 linen thread tie are the traditional elements. The printed card stock, tiny buttons, sewing machine, butterfly and flower button are digital designs. I certainly enjoyed making this card, and hope my team will like it too. Ribbon and button are from Sale-A-Bration brochure (link on right side of blog) and can be found on Pg 7. Ribbon & Button Pack, Ice Cream Parlor .. item #123529. (remember these items are earned, they cannot be purchased). When you order the Vanilla Rosettes, you will receive a package of 18 (6 each of 3 different sizes - 1/2" 3/4", and 1"). The Rosettes are 100% polyester. Mini glue dots are used to adhere the flowers to your projects. To change the color of the rosette, use a Stampin' Write Marker in the color of your choice. Use the wide tip and start coloring in the petals. I used a pair of tweezers to rotate the rosette and also to flip it over. Allow to dry thoroughly before using. The color will not be an exact match to the marker, but will compliment it beautifully. At our team meeting last weekend, Joan gave me this wonderful snap bag that she had made. Isn't is fantastic!!!! The opening actually "snaps" shut. It has a tape measure sewn into the edging for the snap. I love the bright colors of the bag. Joan, thank you so much for making this bag for me. It really is wonderful. You are very talented and creative. There are Designer Big Buttons, item #122302 to match the fabric. Think of all the projects you could make combining these items. On Page 35 of the Occasions Mini Catalog, you will find Pompom Trim which is approximately 1/4" wide and 5 yards on a roll. The trim is 100% nylon and comes in three colors. I found that when I cut it, it did not ravel (a big plus in my book). I used Multipurpose liquid glue to adhere the trim and it worked extremely well. I just used a thin line of it down the edge of the card, then gently placed the trim on top then firmly pressed. 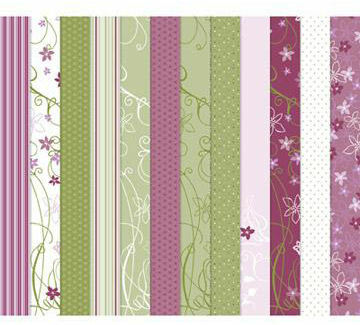 The trim could be easily used on a card, scrapbook, or a sewing project. 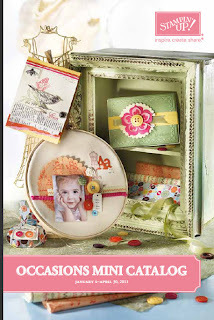 The self-adhesive die cuts and Designer Series Paper are from the Sale-a-Bration Brochure on Pg 7. It is called Ice Cream Parlor. So quick to create a card using the DSP and die cuts. This is my first attempt at quilling. Even the petals of the flower are rolled paper (quilling). You change the look by how tight or how loose you roll the paper. Background card stock is from Stampin' Up! 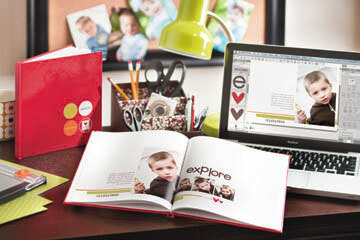 The following video is narrated by Shelly Gardner, Stampin' Up! CoFounder and CEO. Would you like a Stampin' Up! Catalog? 1. That you are not already working with a Stampin' Up! Demonstrator. We pay for the catalogs ourselves as well as the mailing costs. 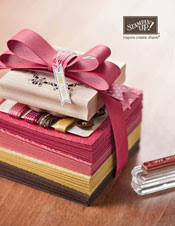 Since I am NOT charging you for the catalogs, I would like them to go to you as a prospective customer with the understanding that you would use me as your demonstrator "IF" you should decide to purchase Stampin' Up! products. 2. That you live in the United States. I am not allowed to sell outside of the US according to Stampin' Up! policy. 3. You will need to send me a valid e-mail address, full name, and mailing address. Once I have this information, I will mail them out First Class Mail. E-mail the information to me at kreateskards at cox dot net or use the e-mail link above in my header to the blog. New customers are always welcome. If you are thinking about joining my Stampin' Up! Team, drop me a note and I will send you additional information. Starter kits are 15% off during Sale-a-Bration. Many join as Hobby Demonstrators just to get the discount on their own purchases. That's how I started out 2 1/2 years ago. Stampin' Up! just released 8 new digital downloads today. Wait till you see them. 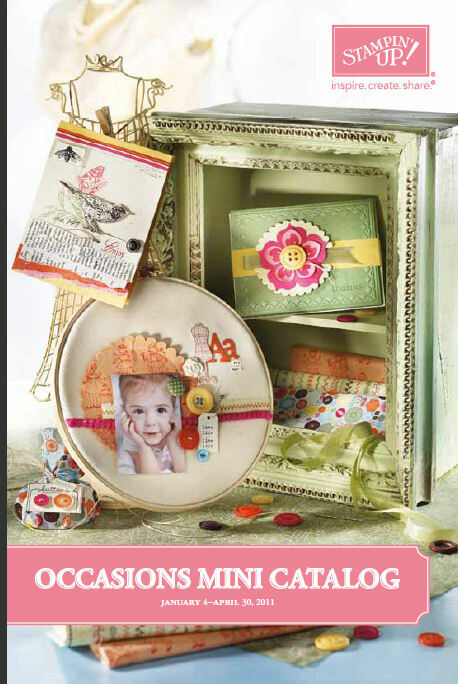 There are butterflies, polystitched ribbons, nursery DSP along with matching embellishments, and 4 stamp brush sets. You can view the pdf file HERE. I'm having so much fun combing digital and original to create some fabulous hybrid cards. All of the downloads are listed under "digital designing" when you click on SHOP Now from my Stampin' Up! website. Also if you click on the My Digital Studio Catalog on the right on my blog, you will have a complete catalog thru the end of last month. This will be updated monthly by Stampin' Up!. It is a great way to keep track of your purchases too by printing it out and checking off what you have. I was going over my blog posts and realized that it has almost been 2 years since I started my blog. # of comments: Oh my gosh, I have no idea but do know there are LOTS. I enjoy feedback on my posts. It gives me an idea of which projects you like. Thank you all for being so supportive of my blog. 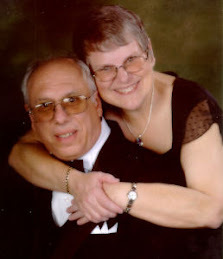 If you know of anyone that may like my blog too, please send them a link and let them know too that I am a Stampin' Up! Demonstrator. Stampin' Up! has become a true passion for me. I absolutely love being a demonstrator, a teacher, and a supervisor. How many can say they get paid for doing what they LOVE. Just a reminder that the links to all of the catalogs and the Sale-a-Bration brochures are on the right side of my blog. Please help support my blog and my Stampin' Up! business by buying your products thru me. Your orders are greatly appreciated. Score the 4 ¼” x 5 ½” piece at 2 1/8” (on the 4 ¼” side). Crisply fold with your bone folder. Stamp Circle Circus images on one side. This is the back part of your card. Score both pieces of the 4 ¾” x 1 ½” at ¼”, 2 3/8” and 4 ½”. Ends will fold inward, center fold will fold outward. Using SNAIL Adhesive or Sticky Strip, attach the strips to the top and bottom of the card. Remember the end flaps go on the inside NOT the outside of the back of the card. 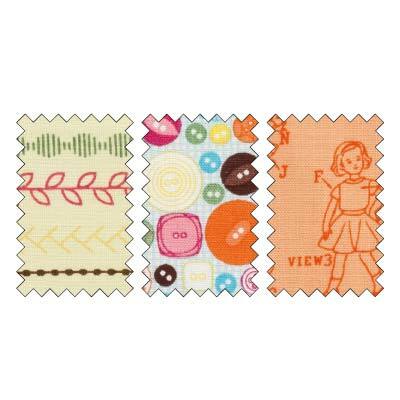 Punch out the two Dotted Scallop Ribbon Borders. They will be 4 ¼” long. Using Multipurpose Liquid Glue, attach to the front top and bottom pieces. Punch out 4 of the 1 3/4” Scallop Circles. Place one piece of the vellum strip inside and glue the two scallops together. Stamp 2 sentiments on Brushed Silver Card Stock, then punch out each one with Word Window Punch. Using SNAIL adhesive attach to Scallop Circle front. Attach a dimensional to the top front of the vellum strip and attach to the mark inside the top strip of the card (you marked it earlier). Your card is now complete and when folded flat should fit nicely into an A2 envelope (standard card envelope). Switch out the colors, the stamped images to change the look. This is a fun card for any age or any occasion. Hope you all have a very Happy Valentine's Day. Sahara Sand Card Stock, item #121043. 1. Score your piece of Sahara Sand Card Stock at 4 ¼” Then crisply fold using your bone folder. 3. Punch out 1 ¾” circle in the Marina Mist Card Stock. Then punch out a 2 ½” circle around the opening. Offset the punch when you do this. 5. Stamp the owl from Punch Bunch with Marina Mist Classic Ink, then punch him out using the Two-Step Owl Punch. 6. Using SNAIL or Sticky Strip, attach the Basic Gray piece of Card Stock to the bottom front of your card. 7. Using Multipurpose Liquid Glue, attach 2 ½” circle to center of the Basic Gray. 8. Using a Dimensional, attach Bashful Blue Circle with Jumbo Eyelet to inside of Marina Mist Circle. 9. Using a Dimenstional, attach owl to your card. 10. Sentiment may be stamped on the inside of the card. Great masculine card for birthdays, anniversaries, of just thinking of you.